Off Main Street, downtown Kernersville (or K’ville, as many of us call it), there’s a quaint little alley with a few shops and a restaurant, called the Bistro B. 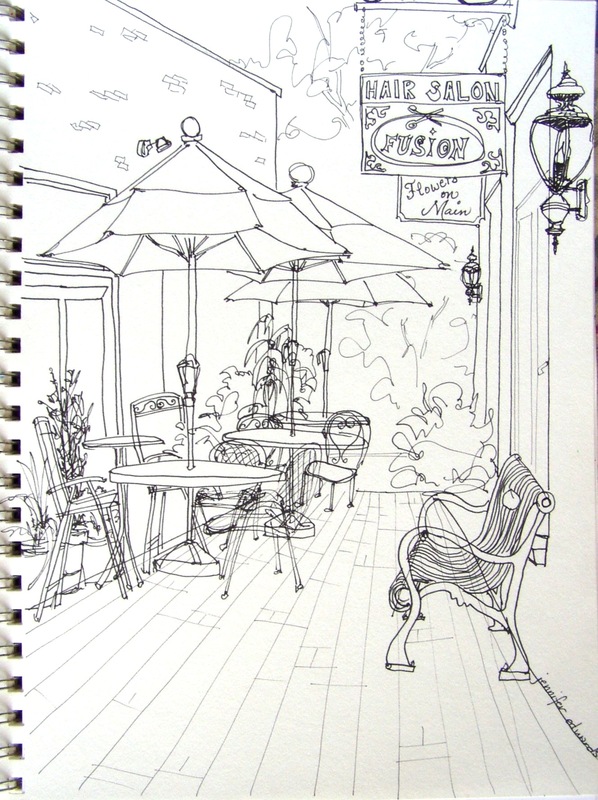 Though you don’t see it well in this sketch, the Bistro is directly on your left with tables and umbrellas for dining outside. I have loved this alley for many years and used to frequent it quite a lot when Salem Kitchen was in the spot where the Bistro is now. As we drew, my friend, Debbie, and I reminisced about those days, for we used to hang and sell our artwork in Salem Kitchen. They were so generous to us local artists to let us hang our work in there. I miss those days. I love to visit your blog! always a lively drawing or more to see. Your style is so engaging. Thank you Liz! Your compliment comes at a perfect time. You have such a lovely spot to sketch! I can almost smell the coffee! This even has a feel of a special memory! What a gorgeous drawing. It looks like the perfect place to spend a spring afternoon. You’ve certainly captured the moment. I feel that I’m running around to much and you help to slow me down. Very nice sketch. It reminds me of a spot by my sister’s house in Oceanside, Ca. I like sketches like these to be able to go look at again so I can enjoy the area all over again. It’s a refreshing kind of spot from your drawing at least! what a sweet cosy little courtyard, nice one!